The adrenal cortex is a major site of steroid hormone production. Two hormones are of particular importance: aldosterone, which is produced in the zona glomerulosa in response to volume depletion and hyperkalemia, and cortisol, which is produced in the zona fasciculata in response to stress. In both cases, acute stimulation leads to increased hormone production, and chronic stimulation causes hyperplasia of the respective zone. Aldosterone- and cortisol-producing adenomas (APAs and CPAs) are benign tumors of the adrenal cortex that cause excess hormone production, leading to primary aldosteronism and Cushing’s syndrome, respectively. About 40% of the APAs carry somatic heterozygous gain-of-function mutations in the K+ channel KCNJ5. These mutations lead to sodium permeability, depolarization, activation of voltage-gated Ca2+ channels, and Ca2+ influx. Mutations in the Na+/K+-ATPase subunit ATP1A1 and the plasma membrane Ca2+-ATPase ATP2B3 similarly cause Na+ or H+ permeability and depolarization, whereas mutations in the Ca2+ channel CACNA1D directly lead to increased calcium influx. One in three CPAs carries a recurrent gain-of-function mutation (L206R) in the PRKACA gene, encoding the catalytic subunit of PKA. This mutation causes constitutive PKA activity by abolishing the binding of the inhibitory regulatory subunit to the catalytic subunit. These mutations activate pathways that are relatively specific to the respective cell type (glomerulosa versus fasciculata), and there is little overlap in mutation spectrum between APAs and CPAs, but co-secretion of both hormones can occur. 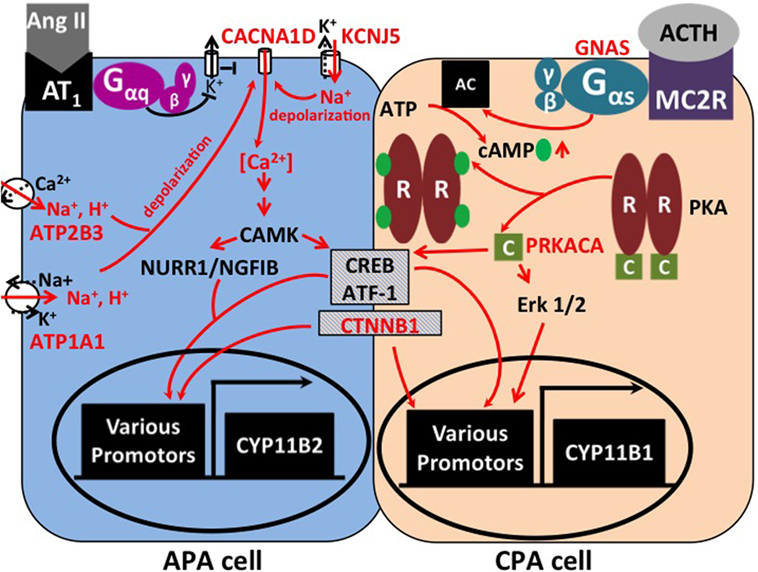 Mutations in CTNNB1 (beta-catenin) and GNAS (Gsα) are exceptions, as they can cause both APAs and CPAs through pathways that are incompletely understood. Adrenal masses are common tumors in humans. Adrenal incidentalomas may be found in more than 4% of computed tomography series (1), and about 7% are malignant (2). Among hormone-producing lesions, besides pheochromocytomas, cortisol-producing and aldosterone-producing adenomas (CPAs and APAs) of the adrenal cortex are frequently diagnosed (2). Aldosterone and cortisol are physiologically synthesized in the two outer layers of the adrenal cortex (zonae glomerulosa and fasciculata, respectively) from their common precursor cholesterol. The two main stimuli of aldosterone production are angiotensin II (ATII) and hyperkalemia. ATII levels rise in states of volume depletion, via activation of the renin–angiotensin system. Binding of ATII to the AT1 receptor, a G protein-coupled receptor in the glomerulosa membrane, leads to the inhibition of potassium channels, depolarization and activation of voltage-gated calcium channels, and the release of calcium from intracellular stores (Figure 1). Other factors that physiologically regulate aldosterone release in concert with ATII and K+ are corticotropin (ACTH, stimulatory) and atrial natriuretic peptide (ANP, inhibitory) (3). Binding of aldosterone to the mineralocorticoid receptor leads to the increased activity of downstream effectors, such as the Na+/K+-ATPase or the epithelial sodium channel (ENaC) (4). The increased activity of these pumps and channels in kidney and intestine causes increased sodium and water reabsorption and an increase in systemic blood pressure. Figure 1. Signaling pathways affected by mutations in APAs and CPAs. In zona glomerulosa, binding of angiotensin II (AngII) to its receptor inhibits potassium channels via G protein signaling. This leads to depolarization and opening of voltage-gated calcium channels. Increased intracellular calcium results in the activation of Ca2+/calmodulin-dependent protein kinase (CAMK) and the activation of transcription factors, such as NURR1/NGFIB, CREB, and ATF-1. As a consequence, genes involved in proliferation and aldosterone production (e.g., aldosterone synthase, CYP11B2) are activated (5). Mutations in KCNJ5, ATP1A1, and ATP2B3 lead to abnormal permeability for sodium or protons, which causes cellular depolarization and activation of the same pathways. Similarly, mutations in the calcium channel gene CACNA1D lead to increased calcium influx. In the zona fasciculata, binding of corticotropin (ACTH) to the melanocortin receptor (MC2R) causes activation of adenylate cyclase (AC) by the Gαs subunit (encoded by GNAS). Binding of cAMP to the regulatory subunit (“R”) of protein kinase A (PKA) leads to release of the catalytic subunit (“C,” encoded by PRKACA) from the complex. Transcription factors CREB, ATF-1, and Erk 1/2 cause increased expression of genes involved in proliferation and cortisol production, such as 11β-hydroxylase (CYP11B1). Hypercortisolism can occur due to activating mutations in GNAS and PRKACA. Activating mutations in β-catenin (CTNNB1) are found in both APAs and CPAs; the underlying mechanisms are incompletely understood. Cortisol is released from the zona fasciculata upon stimulation by pituitary ACTH, in response to stress. ACTH binds to the melanocortin receptor 2, a G protein-coupled receptor, which activates adenylate cyclase (6). As a result, cAMP is produced, which binds to the regulatory subunit of protein kinase A (PKA), causing release of its catalytic subunit. The catalytic subunit then phosphorylates target proteins, such as CREB and ATF, which lead to cortisol production and proliferation (7) (Figure 1). Cortisol influences a variety of biological processes, including skeletal growth, immune response, glucose and lipid metabolism, cognition, and reproduction (8–10). Cortisol-producing adenomas and APAs feature the compelling combination of both hormone production and proliferation, suggesting that they carry genetic changes that activate both processes. Such changes have been identified over the past 5 years through exome sequencing. Comparing DNA sequences from tumor specimens and corresponding normal tissue (such as blood or adjacent tissue) can reveal tumor-specific (somatic) mutations, which are candidates for disease causation (11). This review will discuss recent genetic discoveries in APAs and CPAs and the underlying pathways. Primary aldosteronism (PA) features autonomous production of aldosterone from the adrenal gland and accounts for about 10% of hypertension in referral centers. The two most common causes are APAs and bilateral adrenal hyperplasia. Other causes, such as unilateral hyperplasia, malignant tumors, or familial hyperaldosteronism, are rare (12–16). In the first exome sequencing study of APAs, Choi et al. analyzed four tumors and corresponding blood samples (11). This revealed only two to three somatic mutations per tumor. One gene (KCNJ5) was mutated in two tumors, with one tumor carrying a heterozygous G151R mutation, and the second carrying a heterozygous L168R mutation. By Sanger sequencing, these two mutations were found in 6 of 18 additional APAs. KCNJ5 encodes an inward rectifier potassium channel, Kir3.4, or GIRK4. The G151 and L168 residues are located within or close to the selectivity filter of the channel (17), which allows only potassium, but not the smaller sodium ions, to pass through the channel. This suggested an effect of the variants on potassium selectivity. Accordingly, by electrophysiology, mutant channels were found to be permeable to sodium and cause cellular depolarization. These effects were inferred to contribute to aldosterone production and proliferation through the activation of voltage-gated calcium channels and calcium entry (3, 11) (Figure 1). Additional support for the notion that KCNJ5 mutations are sufficient to cause aldosterone production and proliferation came from the discovery of heterozygous germ line KCNJ5 mutations in families with early-onset PA and massive bilateral adrenal hyperplasia (11, 18–20). The high frequency of KCNJ5 mutations in APAs (about 35% in European cohorts, more than 60% in Asian cohorts) has subsequently been confirmed in large cohorts (21–29) (Table 1). A higher prevalence in Asian cohorts may be due to selection bias; individuals with KCNJ5 mutations tend to have a more florid presentation at least in some cohorts. Interestingly, KCNJ5 mutations are more prevalent in females than in males, which could account for the higher overall prevalence of APAs in females, a finding that remains unexplained. In vitro studies in the aldosterone-producing human adrenocortical cancer cell line HAC15 have demonstrated that gain-of-function mutations in KCNJ5 lead to increased expression of aldosterone synthase and increased aldosterone production (30–32). Lastly, a recent study confirmed the role of CYP11B2 transcriptional regulators NURR1 and ATF2 in mutant KCNJ5-induced aldosterone production (33) (Figure 1). Table 1. Mutation frequencies in APAs, A/CPAs, and CPAs. Interestingly, tumors with KCNJ5 mutations tend to be larger than other tumors and have fasciculata-like features by histopathology and gene expression analysis, which may have implications for the radiological diagnosis of these tumors (34–36). Another line of evidence pointing to a more fasciculata-like or mixed glomerulosa–fasciculata phenotype of KCNJ5-positive APAs is the finding that heterologous expression of a KCNJ5 variant in HAC15 cells causes not only upregulation of CYP11B2 expression but also increased expression of CYP11B1 and synthesis of hybrid steroids 18-hydroxycorticsol and 18-oxocortisol, as well as corticosterone (31, 33). This raises the question whether KCNJ5-positive APAs produce clinically relevant amounts of glucocorticoids. Interestingly, hypersecretion of cortisol and aldosterone are not mutually exclusive in adrenal adenomas, and cases of aldosterone and cortisol co-secreting adenomas (A/CPAs) have been reported (37–40). This phenotype may be underdiagnosed due to incomplete screening for subclinical Cushing’s syndrome (CS) in patients with APAs; many of these patients will not receive dexamethasone suppression tests. Yamada et al. reported three female patients with hypertension and hypokalemia who were diagnosed with A/CPAs. Two had KCNJ5 mutations (G151R and L168R) (40). Thiel et al. reported KCNJ5 mutations (G151R and L168R) in two of four A/CPAs, and no mutations in PRKACA, ATP1A1, ATP2B3, and CACNA1D were found (41). Lastly, Nakajima et al. demonstrated KCNJ5 mutations in 6 of 10 A/CPAs (42). This suggests that KCNJ5 mutations may cause excess secretion of not only aldosterone but also glucocorticoids, leading to PA with discrete features of CS. Potential explanations include the overlapping role of transcriptional regulators CREB and ATF in the regulation of both aldosterone and cortisol production (Figure 1) as well as a potential role of Ca2+ in cAMP formation (43). In summary, KCNJ5 mutations have been extensively studied in the context of PA. However, the physiological role of KCNJ5 in human adrenal glomerulosa remains largely undetermined, and animal studies have been hampered by extremely low or absent expression of kcnj5 in rodents (44). 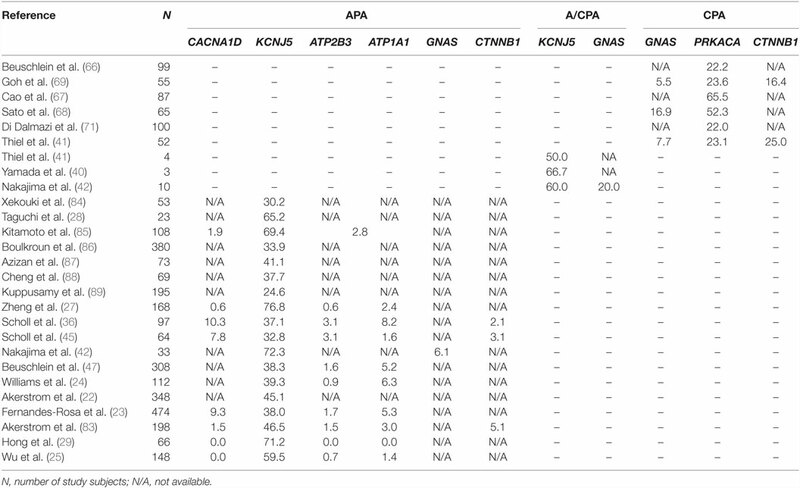 The gene with the second highest somatic mutation burden in APAs is CACNA1D, with frequencies of about 8–11% described in the initial exome sequencing studies and similar findings in a large follow-up study (23, 35, 45) (Table 1). Similar to KCNJ5 mutations, CACNA1D mutations are heterozygous. However, mutations are more scattered throughout the protein. CACNA1D encodes an L-type voltage-gated calcium channel (CaV1.3). Mutant CACNA1D channels show activation at more hyperpolarized membrane potentials and, in some cases, reduced channel inactivation compared to wild-type channels (45). In line with the notion that these effects will lead to increased calcium entry, expression of mutant CACNA1D channels causes increased aldosterone production in the adrenocortical cancer cell line H295R (46). Again, similar to KCNJ5 variants, additional evidence for a role of CACNA1D in PA came from the discovery of germ line variants at the same positions found to be mutated in tumors (45). Among 100 unrelated subjects with early-onset PA and hypertension, two carried de novo mutations in CACNA1D. Interestingly, these subjects had a multi-organ phenotype, including primary aldosteronism, seizures, and neurologic abnormalities (PASNA) (45). The discovery of mutations in calcium channels as a cause of PA may suggest that specific calcium channel blockers could be useful in patients carrying such mutations (46). Additional somatic mutations in APAs without corresponding germ line mutations have been identified. Beuschlein et al. first described heterozygous or hemizygous somatic mutations in the ATP1A1 and ATP2B3 genes in 5.2 and 1.6% of APAs, respectively. ATP1A1 encodes a sodium/potassium ATPase subunit, whereas ATP2B3 encodes the plasma membrane calcium ATPase. Mutations in both ATPases cluster within the M4 helix, again suggesting a gain-of-function mechanism (47). Azizan et al. subsequently demonstrated that ATP1A1 mutations cause an ouabain-sensitive, voltage-dependent inward Na+ or H+ current, respectively. Heterologous expression of mutant ATP1A1 in human adrenocortical H295R cells led to increased aldosterone production and CYP11B2 expression levels (35), consistent with a role of mutant ATP1A1 in cellular depolarization and activation of voltage-gated calcium channels, as with mutated KCNJ5. Similarly, a mutation in ATP2B3 was shown to induce a pathological Na+ permeability, with increased intracellular Ca2+ levels and aldosterone production in H295R cells (48). Azizan and colleagues first suggested an association of CACNA1D and ATP1A1 mutations with a glomerulosa-like phenotype (35), whereas other groups reported mixed histological phenotypes (23, 36). Glomerulosa-like features in CACNA1D and ATP1A1-positive tumors could suggest that these tumors are derived from zona glomerulosa cells. Indeed, Nishimoto et al. recently studied 42 normal adrenal glands from kidney donors and identified so-called aldosterone-producing cell clusters (APCCs), nests of cells just below the adrenal capsule that feature high expression of aldosterone synthase and protrude into cortisol-producing cells (49). Remarkably, targeted next-generation sequencing of DNA from 23 APCCs identified known somatic CACNA1D mutations in six cases and known somatic ATP1A1 mutations in two cases, suggesting that APCCs may represent precursors of a subtype of APAs. These results also support the presence of APCCs and potentially subclinical PA in a substantial number of apparently healthy individuals, which is interesting, given that prior clinical studies identified a higher risk of developing hypertension in individuals with increased aldosterone levels within the physiologic range (50). No somatic KCNJ5 mutations were identified in APCCs, suggesting that APAs carrying such mutations may arise from cells of the zona fasciculata or may grow more rapidly, with precursors evading detection in apparently healthy individuals. Even though the classical presentation of aldosterone-producing adenoma is that of a uninodular lesion, many cases feature associated hyperplasia or multiple secondary nodules, many of which do not show increased expression of aldosterone synthase. Investigations of individual nodules revealed the presence of characteristic APA mutations in aldosterone-producing nodules, whereas non-producing nodules do not carry such mutations (51). Some individuals carry different aldosterone-driver mutations in different nodules, suggesting that independent mutation events account for the development of multiple nodules (52, 53). Whether germ line susceptibility variants promote the formation of multiple tumors remain to be determined. Interestingly, some adenomas appear to show intra-tumoral heterogeneity, indicating that the somatic events underlying APA formation can also occur in the context of preexisting nodules (53). This has led to the proposal of a two-hit model of adenoma development, with one hit being responsible for proliferation and another hit causing hormone production (54). However, the rarity of such findings and the absence of second hits explaining proliferation in the exomes of tumors carrying aldosterone-driver mutations suggest that APA driver mutations alone are sufficient to cause proliferation and hormone production in the majority of APAs. One additional ion channel gene implicated in PA to date has been found to be mutated in the germ line only, but not in APAs. A novel germ line heterozygous variant in the CACNA1H gene (M1549V) was found in 5 of 40 unrelated subjects with PA and hypertension diagnosed at age 10 or below (55). Microscopic glomerulosa hyperplasia without macroscopic enlargement was demonstrated in one subject who had undergone unilateral adrenalectomy, suggesting a limited proliferative effect of the variant. CACNA1H encodes the low-voltage-activated T-type calcium channel CaV3.2 (56). CaV3.2 has been hypothesized to be responsible for fine adjustments in the aldosterone production when activated by small changes in potassium or ATII levels and appears to be necessary for glomerulosa membrane potential oscillations (55, 57, 58). The observed M1549V variant causes impaired channel inactivation and a slight shift of activation to more hyperpolarized potentials (55), as well as increased CYP11B2 expression (59), suggesting a pathophysiology similar to that of CACNA1D variants. Cushing’s syndrome features hypercortisolism and is associated with a plethora of signs and symptoms, including weight gain, hypertension, diabetes mellitus, lethargy, acne, depression, hirsutism, and increased mortality (60, 61). CPAs are less frequent than ACTH-secreting pituitary tumors (62), but still account for up to 10% of endogenous CS (60, 63, 64). Somatic PRKAR1A loss-of-function mutations were identified as a cause of sporadic CPAs in a hypothesis-driven approach (65). Following the description of somatic mutations in PA, using exome sequencing, four groups independently identified somatic mutations in the PRKACA gene as a cause of CS (66–69). PRKACA encodes the catalytic subunit of protein kinase A involved in the regulation of adrenal cortisol production (see Introduction and Figure 1). Beuschlein and colleagues sequenced the exomes of 10 CPAs and identified heterozygous somatic PRKACA mutations in eight, with a frequency of 37% in the entire cohort of CPAs associated with overt CS. No PRKACA variants were found in CPAs associated with subclinical CS, APAs, or inactive adenomas, and the presence of PRKACA variants was associated with a more severe phenotype (66). All but one tumor carried a single variant, L206R, suggesting a gain-of-function effect. L206 is located in the highly conserved interaction site between the regulatory and the catalytic subunits of PKA, and binding of the regulatory subunit at this position prevents substrate phosphorylation. Molecular modeling and functional analysis of PKA activity suggested that the L206R mutation would lead to a steric hindrance and prevent inhibition of catalytic activity by the regulatory subunit (70). Somatic PRKACA variants other than L206R are exceedingly rare (71). Further support for the causative role of increased PKA activity in CS came from the discovery of germ line PRKACA duplications in subjects with bilateral adrenal hyperplasia and CS (66). These results were confirmed in independent cohorts. Cao et al. reported an L205R variant (equivalent to L206R in the initial report) in the PRKACA gene in 27 of 39 CPAs. Further, two GNAS (Gαs) mutations and a CTNNB1 (β-catenin) mutation were found (see below) (67). Sato et al. screened tumors of 65 patients with ACTH-independent CS. They identified PRKACAL206R mutations in 52.3% and GNAS mutations in 16.9% of the tumors. In addition, they provided evidence of an association of PRKACAL206R with smaller tumor size and a more severe phenotype (68). Lastly, Goh et al. reported a PRKACAL206R mutation in 24% of CPAs (35% of cases with overt CS). They also reported CTNNB1 mutations in 16% and GNAS mutations in 6% of tumors (69). Similar results were found in additional cohorts (39, 41, 71) (Table 1). Functionally, L206R has been shown to enhance the phosphorylation of PKA downstream effectors CREB and ATF in cell culture and tumor tissue samples (69) (Figure 1). Mutations in GNAS have long been known to inhibit GTPase activity of the Gαs subunit and thereby cause constitutive Gαs activation, abnormal cAMP signaling, endocrine hyperfunction, and tumor formation; postzygotic GNAS mutations are found in McCune–Albright syndrome, which can be associated with CS (72, 73). The discovery of mutually exclusive somatic gain-of-function mutations of PRKACA and GNAS in CPAs (see above) has further demonstrated that increased cAMP signaling is sufficient to cause tumorigenesis and cortisol hypersecretion. However, somewhat unexpectedly, given the absence of PRKACA mutations in APAs, GNAS variants were also reported in A/CPAs in two instances (42). On a molecular level, given the accessory role of ACTH in stimulating aldosterone secretion, increased cAMP signaling may play a role. CTNNB1 encodes β-catenin of the Wnt/β–catenin pathway, which is known to play an important role in adrenocortical development and cancer (74). Activating mutations are not only found in benign and malignant adrenal tumors (75) but also in tumors of other organs. Such mutations prevent β-catenin degradation and cause proliferation. Even though such events have been shown to trigger benign aldosterone-secreting and cortisol-secreting tumor development as well as malignancy in a mouse model and human tissue samples (36, 45, 69, 75–77), the exact mechanisms underlying hormone secretion in CTNNB1 positive tumors remain to be determined. In this context, a common pathway of PRKACA, GNAS, and CTNNB1 has been suggested (78). However, it has been shown that GNAS and CTNNB1 mutations are not always mutually exclusive in CPAs, and that mutations of CTNNB1 are also present in non-secreting adrenal tumors (79). A recent study described an association with pregnancy in two of three cases with APAs and CTNNB1 mutations and suggested that the manifestation may be mediated by CTNNB1-induced LHCGR expression and increased LH levels in pregnancy (80). However, the absence of an association with pregnancy in previously described female cases (81), the high prevalence of LHCGR overexpression in APAs (82), and the finding of CTNNB1 mutations in male individuals with APAs (83) suggest a role of additional factors. Taken together, the recent findings on the genetic causes of APAs and CPAs suggest that both result from gain-of-function mutations that concurrently lead to excess hormone hypersecretion and increased proliferation. In most cases, a single mutation is apparently sufficient for tumor formation and hormone hypersecretion. There is little overlap between CPAs and APAs in terms of the mutational spectrum. While CPAs often carry mutations that lead to increased intracellular cAMP levels, mutations known to cause APAs mostly affect intracellular calcium signaling. Overlapping roles in the function of transcription factors ATF and CREB in glomerulosa and fasciculata function, as well as overlapping roles of signaling downstream of ACTH and calcium in cortisol and aldosterone synthesis, may explain the presence of KCNJ5 and GNAS mutations in tumors secreting both cortisol and aldosterone (Figure 1). Open questions include the determinants of the histological phenotype of APAs with certain mutations, the molecular pathways involved in proliferation of both APAs and CPAs, potential additional factors that drive hormone production in tumors with CTNNB1 mutations, and the pathogenesis of tumors without mutations in known driver genes. In summary, despite significant progress over the past few years, the pathophysiology behind CPAs and APAs has not been fully unraveled. Distinct and common molecular switches appear to exist in both disorders. This work was funded by a grant of the Ministry of Innovation, Science and Research of the State of North Rhine-Westphalia (NRW Rückkehrerprogramm to US). 12. Conn JW. Presidential address. I. Painting background. II. Primary aldosteronism, a new clinical syndrome. J Lab Clin Med (1955) 45:3–17. Copyright: © 2016 Seidel and Scholl. This is an open-access article distributed under the terms of the Creative Commons Attribution License (CC BY). The use, distribution or reproduction in other forums is permitted, provided the original author(s) or licensor are credited and that the original publication in this journal is cited, in accordance with accepted academic practice. No use, distribution or reproduction is permitted which does not comply with these terms.